Well here’s an awkward post. So I don’t actually feel that diabetes came into play any more than any other factor for 99% of the choices I’ve made in my life. Having said that, I do know that diabetes does play a much larger role in other people’s lives so I don’t want you to think that just because it didn’t happen to me that I think it can’t be possible for you. But I didn’t want to miss the first blog post just because I don’t have much to say! I wasn’t diagnosed until 26. By that time, my self-image had already been formed, I had a chosen career and had a full life. Even now, 15 years later, I don’t feel as if diabetes has made any possibilities (except for one) highly improbable or too difficult to overcome. What was my one choice that I felt diabetes played a major role in my decision? In 2004 when I got divorced, I debated joining a Buddhist monastery. I just couldn’t figure out how I would get health insurance and get insulin, much less afford to stay on the pump. Ok, so there were a few other factors at play, but I really felt the concern of how was I going to afford life-saving medical supplies played into my choice. I know of others who do it, so I know it’s completely possible, but I didn’t feel the ends justified the means. And I think that’s key – I do believe that I can do most anything I want – just how hard do I want to work at it? There’s no denying that having diabetes makes even normal life much more complex, but if I truly value something, I normally can find a way. Most likely at what I would consider a snail’s pace and my patience wears thin quickly, but I do think that I can find a way for most things. 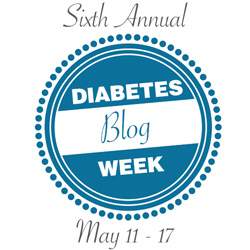 I think it’s great to share that diabetes is just another of a bunch of factors in your life. We could probably all learn to look at things that way too.